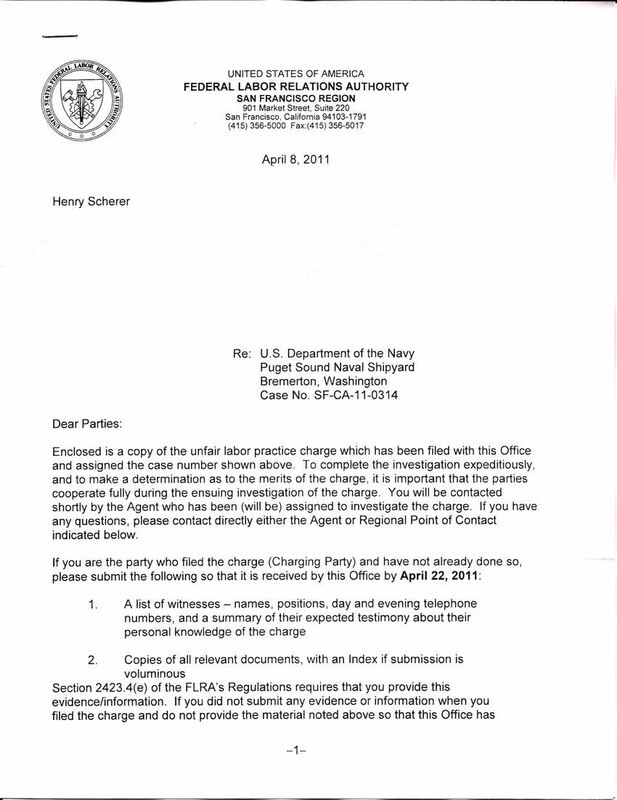 The Unfair Labor Practice Charge (ULP) filed against the U.S. Navy dated 3/28/11 for perjury is at the bottom of this page. 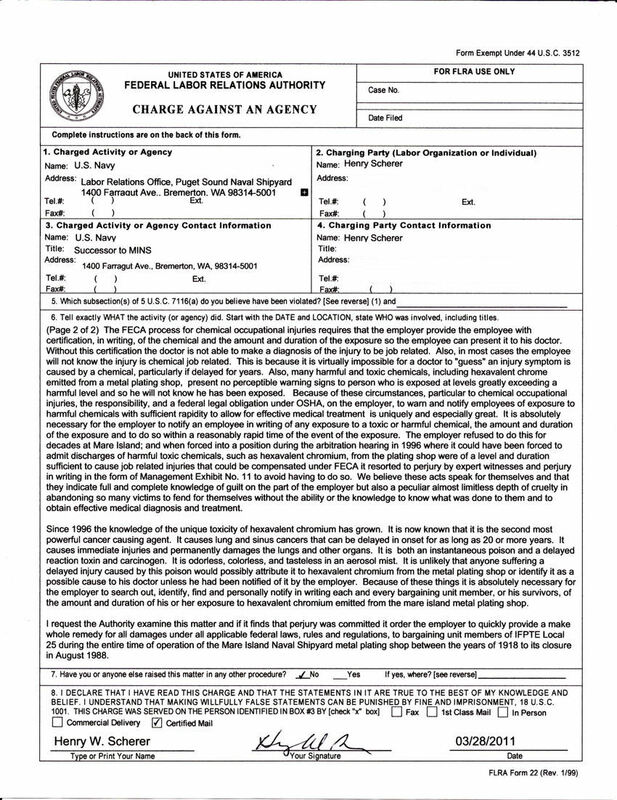 It's current status as of June 2011 is that it is under active investigation by the Federal Labor Relations Authority (FLRA). My expectation is that the process of investigation leading to a final decision is going to take some considerable time. The reasons for this are that the matter is highly technical and the FLRA lawyers are not engineers. The U.S. Navy is going to fight and delay things to the point where the FLRA comes to the decision it is necessary to hire properly qualified outside consultants with an irreproachable reputation to study and decide the matter in an official report; and this is going to be expensive. The U.S. Navy, being in a state of denial and considering the vast cost of compensating all of its victims, is going to use its old time proven tricks of hiding the evidence, denial, delay, name calling and outright lies to the maximum extent possible. Because this is a legal process the U.S. Navy is going to use its boxes full of lawyers to delay, obfuscate and deny for as long as can be done. The U.S. Navy has to believe that all of the honor it has built up since its founding is somehow still merely at risk here and it doubtless still clings to the mistaken belief that this lost honor can somehow be salvaged even though it was completely and irreparably smashed and destroyed beyond redemption when the perjury was perpetrated in 1996. It will take some time for this sad fact to percolate upward through all the many layers of U.S. Navy authority before the U.S. Navy corporate state of knowledge will realize this fact as being a fact. 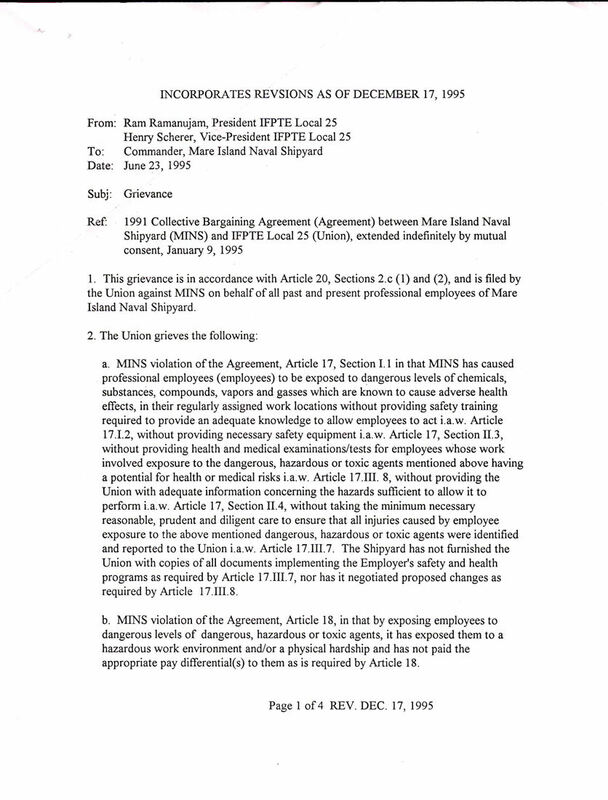 The FLRA must know that if it finds the ULP has merit and decides there has been an unfair labor practice committed that the make whole remedy to the victims must be huge and the U.S. Navy will then fight them with all of its resources to avoid having to pay compensation for all the damages. This is going to result in the FLRA taking the time to make sure of everything with the utmost diligence and care because their entire reputation will be at stake and come-what-may their final decision must be right. This page will be updated as new developments become available. 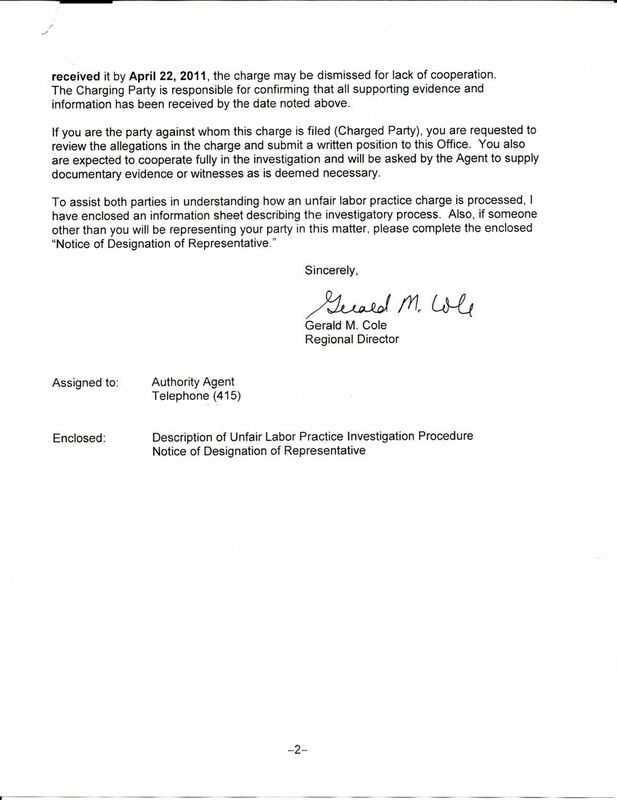 The way the Unfair Labor Practice Charge process works is that under the Federal Law pertaining to federal civil service unionized employees anyone, including their union representative, has the right to file an Unfair Labor Practice Charge with the Federal Labor Relations Authority within 30 days of discovering that an unfair labor practice has been committed by management or by the union. There is no time limit other than this. The entire membership of the Union unanimously decided by a formal vote during the final membership meeting in 1995 that regardless of any circumstance and for all time I will remain their legal union representative for all matters pertaining to the plating shop grievance. Acting in accordance with this duty I have continually prosecuted this matter since then. 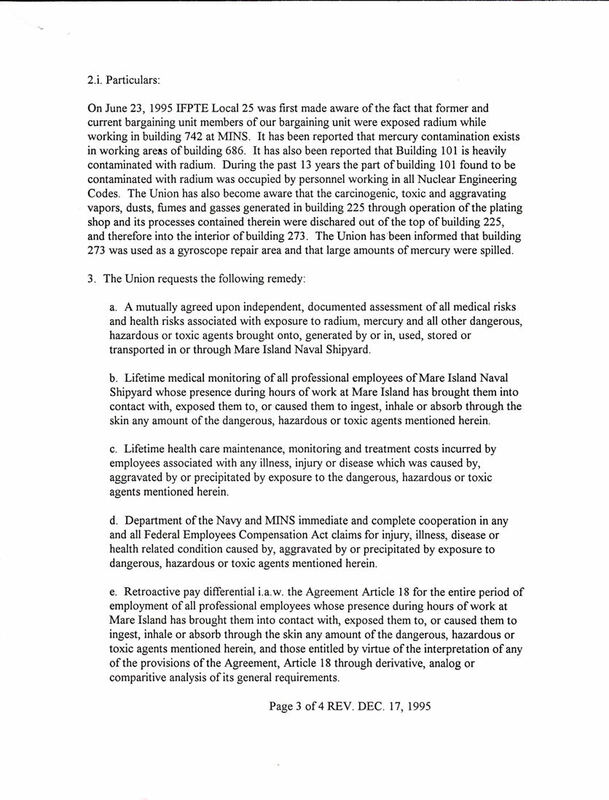 In 2008 during one of an uncountable number of Internet searches for documents related to the Mare Island plating shop I found copies of the official results of testing conducted on the two Mare Island Plating Shop scrubbers conducted in 1988. 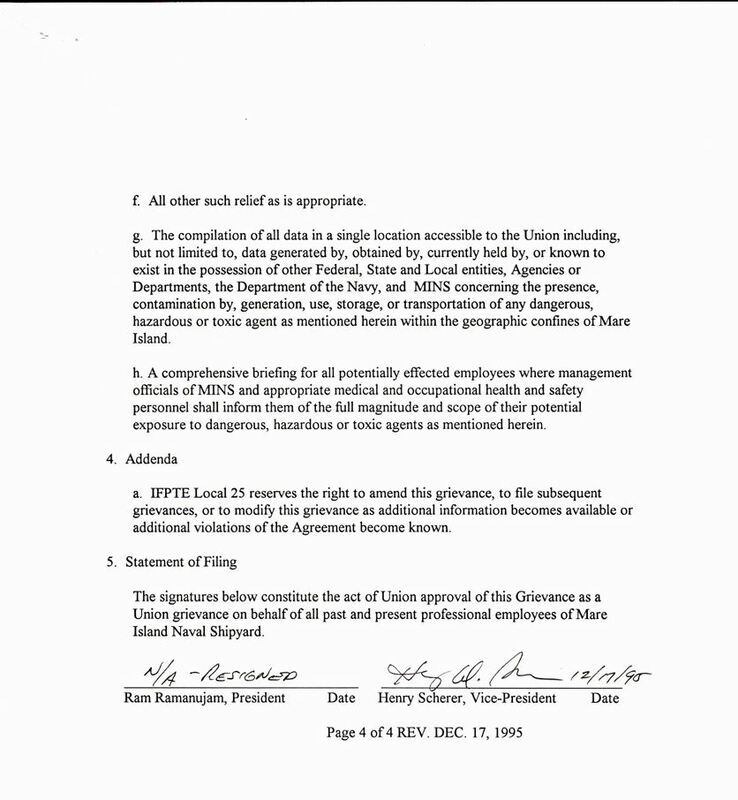 These were documents that management refused to provide to the union in 1995 in spite of a legal obligation to do so. On March 11, 2011 I discovered that these documents had been used in Management Exhibit No. 11 to formulate a complex scheme of perjury that was so important it had been the foundation of the Arbitrators unjust decision in favor of management. Once this was discovered I immediately commenced the construction of the large volume of technical arguments that would be sufficient to convince and demonstrate the perjury to non-engineer labor lawyers in the FLRA the fact of the perjury and the management knowledge and design of it. 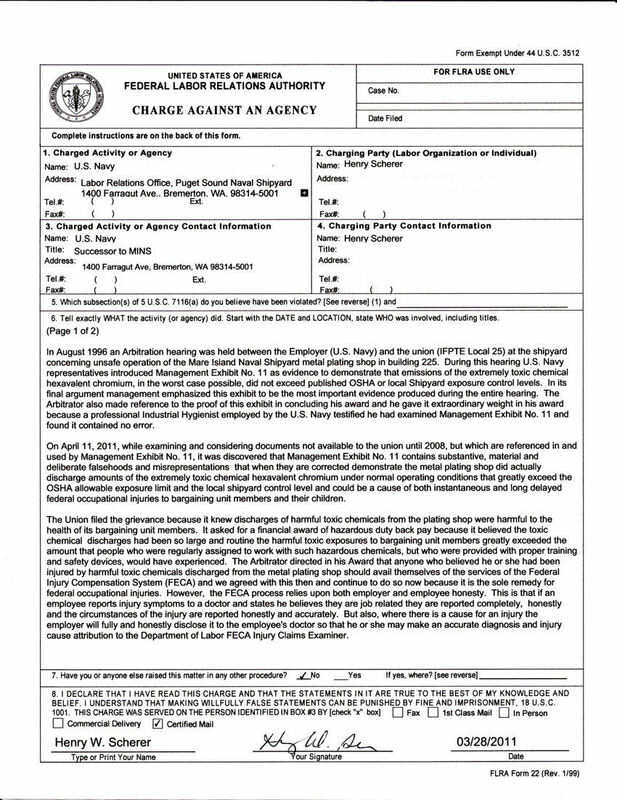 This was a large work that consumed all of my time until the Unfair Labor Charge was submitted to the U.S. Navy and the Federal Labor Relations Authority within the 30 day limit of the discovery of the perjury. 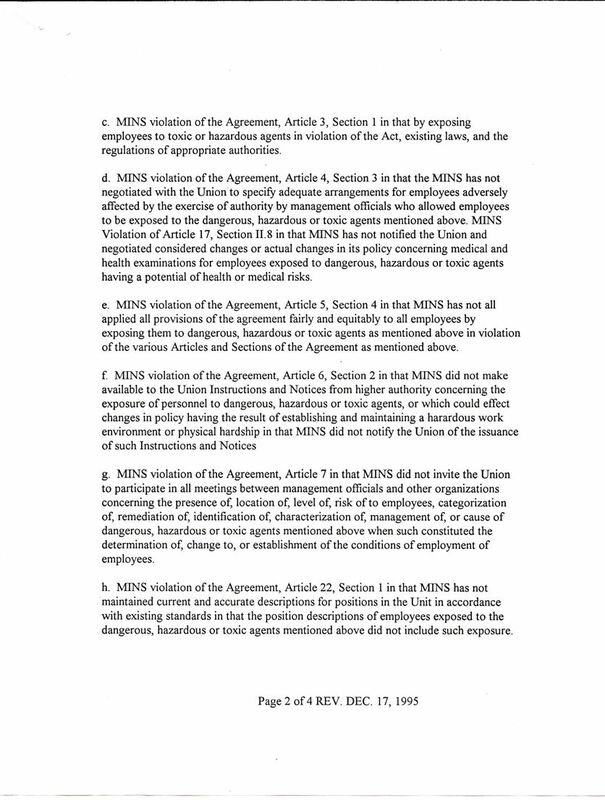 It is my belief there can be no more unfair of an unfair labor practice than perjury and when this is combined with the fact of murder and maiming through deliberate exposure of employees to exceedingly harmful amounts of a chemical known to cause severe injury and deadly cancer the matter cannot possibly be more serious. The FLRA has an obligation under federal law to carefully examine the ULP, to weigh its facts, decide its merits; and it has the legal power to order and enforce a make whole remedy to anyone who has been damaged by the unfair labor practice. This is what we have all been waiting for since 1995 and long before. Here's some history about the grievance: I filed the grievance believing I was probably going to loose it but that because the underlying topic was secret mass murder the moral dimensions were too large to allow it to go un prosecuted. It was absolutely necessary to prosecute it. At that time I was not well and was a lot worse off than I am today as a result of the Airborne Spill in February 1988 ; but was the only person available at the time of the grievance that could prosecute it. This was a tremendous amount of work and it did overwhelm me. Management had done what it took to keep the health damaging emissions of toxic chemicals from the plating shop a secret for so long there was no way they were going to let it out now that the shipyard was closing. I had no doubt they would spend and do whatever it took to win the grievance. But I also have to admit that it never occurred to me to even imagine that they might stoop so low as to commit perjury. Then also there was the medical black hole that management had made it clear they were going to weaponize against me. I filed the grievance for everyone but me, but management personalized it to me. This left them open to use the lack of medical knowledge concerning Hexavalent chrome and its effects on the human body against me as, what I believed then to be their main strategy to win the grievance. Only recently has their perjury been discovered to be their true tactic. The problem confronting you and I in 1996 was that without a grievance being prosecuted to a final decision by an Arbitrator there would never be any future appeal rights and abilities of any kind to use to continue to prosecute this matter on behalf of all the many thousands of uncounted plating shop victims the U.S. Navy has kicked in the face. The simple fact of the matter is someone had to represent the victims because of the almost infinite moral dimensions of the plating shop poisoning. Even though when the Shipyard was closing, and everyone just wanted a good job and were worried about providing for their families, they were victims who were not conscious of what had been done to them. They were victims, many of whom have developed or will develop serious health problems later from being poisoned with chromic acid. Simple justice demands they could not go un represented. The almost limitless moral dimensions of the situation meant that someone had to represent them, and I was on the spot and am still on the spot. I'm on this spot until the U.S. Navy stops stomping on the fingers of the people it poisoned and open up ways and means for them to avail themselves, and their estates, of their FECA rights to injury compensation for exposure to harmful amounts of chromic acid. I hope this day will come soon, don't expect it to, but know it will come one day. I filed the grievance for everyone who had ever been on the shipyard since chromic acid was used there. It was not for me and was never for or about me. I made this clear to management in my discussions with them. The grievance was never about me and so I did not present any evidence at the grievance arbitration hearing about me. It was management who did all that. Now that sufficient time has passed, and valid medical knowledge about the hideous toxicity and fatal long term effects of chromic acid are becoming known, the medical knowledge black hole of the grievance argument is being filled in and their dishonest excuse is being taken away from them. The U.S. Navy is immune from lawsuit for occupational injuries because the United States Congress substituted for the right to sue a Federal Injury Compensation System. This FECA (Federal Employee Compensation Act) is dependent upon the statement of a doctor who examines the injured person and attributes the injury to a work cause. The black hole of medical knowledge in 1988, combined with the U.S. Navy cover up of exposure to chromic acid, absolutely prevented me or anyone else from being able to get any doctor to be able to attribute any injury of any kind to exposure to chromic acid and so management could rely upon this with perfect confidence at the time to use as a shield to cover their crimes. I know one thing. It is a simple equation that history demonstrates is true always and forever: The Passage of Time Results in the Exposure of Truth. I will update this page as developments in the investigation of this ULP proceeds.